RIO DE JANEIRO, BRAZIL – One of the main environmentally protected areas of Rio de Janeiro, the Parque Natural Municipal Chico Mendes (PNMCM) located in the neighborhood of Recreio dos Bandeirantes of Zona Oeste (West Zone), celebrated its twenty-fifth anniversary this June 2014. The Parque Natural Municipal Chico Mendes is a main environmentally protected area of Rio located in Recreio, photo by Alexandre Macieira/RioTur. 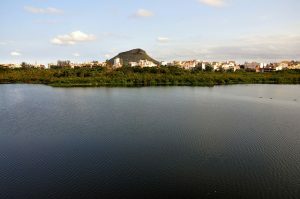 Founded in 1989, the park was created with the intention of preserving the pond, Lagoinha das Tachas and its surroundings. It is a habitat for wildlife, and rare and endangered animals such as the “jacaré-de-papo-amarelo” or “alligator-of-crop-yellow” South American Caiman alligator species. It is one of the few areas of the city where people can sight marshes and sandbanks intact, with other wild animals such as the capivaras and unique native flora and fauna. The area was named after the rubber worker and leader in environmental research, Chico Mendes, who was assassinated in Acre in 1988, a symbol of the struggle for environmental conservation in the country. Little known by most locals, the park has attractions able to please the whole family. The Chico Mendes Park is rich in about 120 animal species already observed. Besides the alligator, the park houses the tegu lizards such as the ameiva and calango. Among the mammals, it is possible to observe sloths and possums. A multitude of birds can be seen and heard on a visit to the park as well such as the restinga. There is also about one hundred species of butterflies which are considered bio-indicators of a healthy environment. Founded in 1989, the park was created with the intention of preserving the pond, Lagoinha das Tachas and its surroundings, photo by Alexandre Macieira/RioTur. A species constantly threatened due to hunting and destruction of their natural habitats, the Caiman is protected in the Lagoinha das Tachas pond with 120,000 square meters of freshwater. The park staff built a deck that extends over it and allows the public to observe the alligators. The park has an animal exhibition where visitors can see tortoises, pythons, turtles and freshwater crocodiles up close. These are captive animals from the park for the visitor to observe up close in order to know them better. With a green area of 44,000 square meters, the park has ten options of trails that are about five miles long, all marked and easy for visitors to follow. One trail is further adapted for people with physical and visual disabilities. There are also guided tours for large groups by appointment. “We welcome and encourage visitors and students to take part in our tours to better know the park and its inhabitants,” says Denise Monores, manager of the Chico Mendes park. In addition to the guided tours, the park also has a library and offers courses, lectures and workshops in drawing and painting. Its great ecological significance, history and landscape offers unique opportunities for environmental education, allowing visitors to be sensitive towards the ecological cause. Apart from the vast green area, the park offers alternative recreation for children, a structure with leisure playground and appropriate places for picnics. Last year, the park inaugurated the “Bicho Fama” or Animal Walk of Fame with the paw prints in concrete of the various animals that live in the park such as the capivara, alligator, owl, possum and lizards. “There’s so many plants and animals to observe in one visit. The best part of the tour is the animal exhibit where one can watch the animals up close,” says twelve-year-old Manuela Lazerdo who recently visited the park with her grandmother. 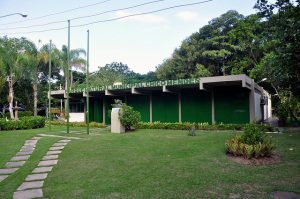 The Chico Mendes Municipal Natural Park is located on Avenida Jarbas de Carvalho, 679, in Pontal de Sernambetiba, Recreio. Entrance is free and is open from Tuesday to Sunday from 8AM to 5PM. Guided tours take place from Tuesday to Friday, in two hours at 10AM and 2PM. For more information, call 21-2437-6400 or visit the Prefeitura website.